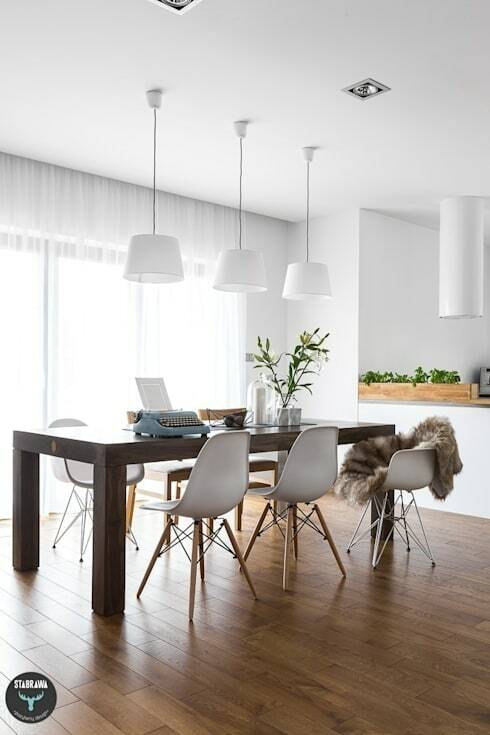 If you're a fan of Nordic design and good interior architecture, you'll love this apartment. 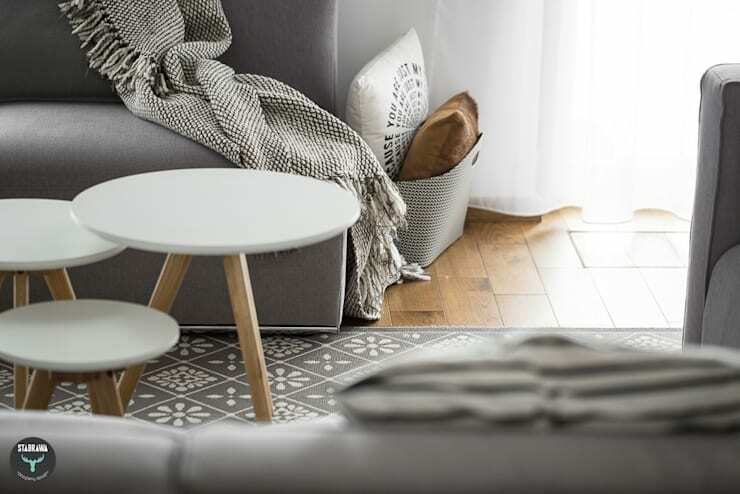 It has silky smooth grey interiors, lots of minimalist elements and those quirky, cosy details that make Scandinavian design so warm and friendly. It's also quite spacious at 270sqm. This is most apparent in the living room that encompasses a double-volume space with a dizzyingly high ceiling. But no matter how small or large your home, this is a Nordic-style abode with patterns, designs and ideas to fuel any lover of good interiors. The best news is that we have lots of photos to show you today. Also, it would be remiss of us not to acknowledge the creators, interior architects Stabrawa. We love their work! 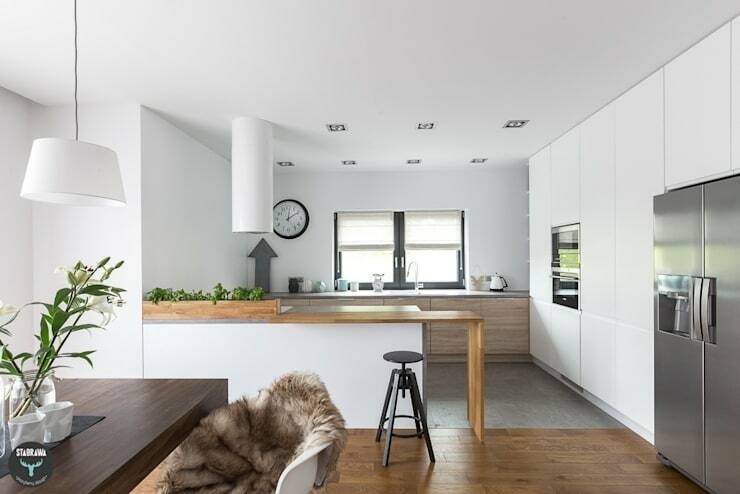 In this view of the kitchen, we can see how the interior architects started with a bright white base. White it always a good choice when using lots of wood elements. It's neutral while also adding that warmth which is so important in a home with a white palette. Note how it's the details and accessories in this home that add all the variety, colour and texture. The largest areas and overhanging areas on the top half of the room are left white to make the room appear as one continuous, seamless whole. It's easy enough to focus on the ground level design of a living room. But when you have a big open space that can be viewed from above, it really pays to plan the design from this angle too. 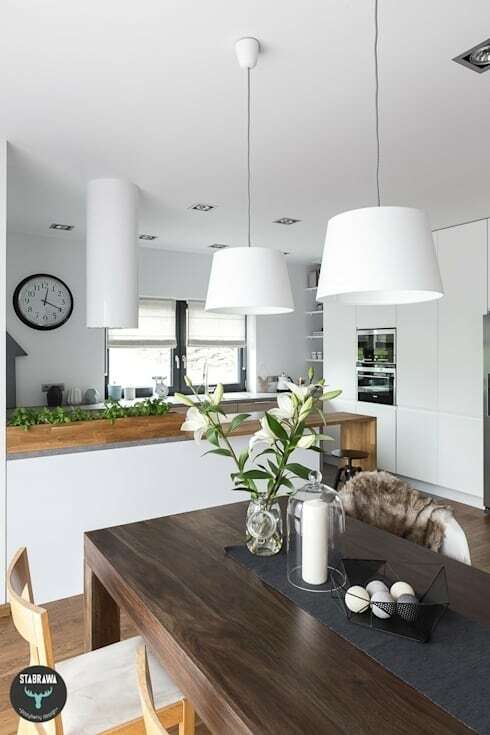 Note how the starburst pattern in the white pendant lamp is reflected in the gorgeous grey carpet. It creates a sense of cohesion in the room and serves to draw attention to the height of the room without weighing it down. This gives the living room a light, airy and free-flowing design that works on multiple levels. The kitchen has a wall mounted oven and lots of smooth white cabinets. 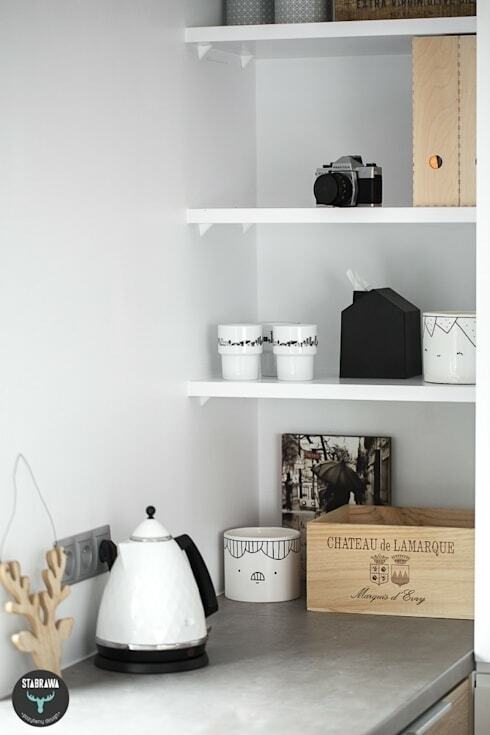 Scandinavian design is also known for its' practicality, so there is a good little open shelving arrangement in the corner too. The very restrained colour palette in this home means that elements can be mixed and matched in a great variety of configurations without losing a sense of cohesion. 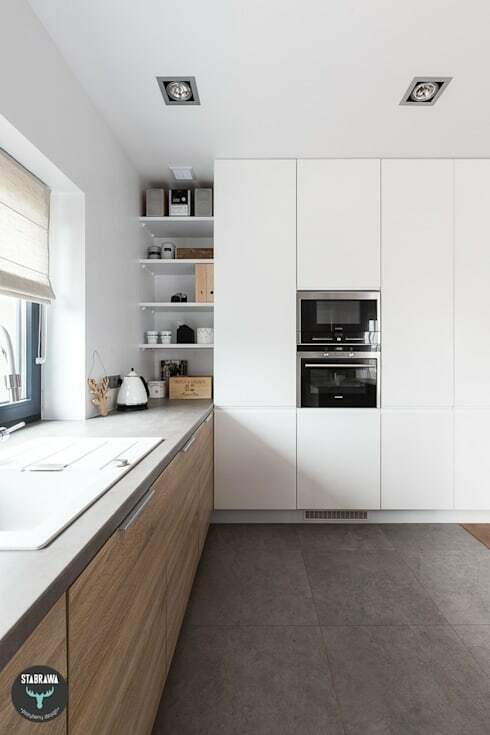 Just look at the smooth transition from the concrete floor to wooden cabinets, white cabinets and grey countertop. Chunky wooden dining tables are really the best. There's no harsh clinking sound when moving dishes around, the surface is hardy and pleasing to touch. A wooden table is also a good choice if you like to use the dining table for general work as well. These tub-style seats with wooden legs are really popular at the moment. The streamlined design is lightweight in every sense of the word. These kinds of chair combinations can also work well with lots of slight variations as long as there is one element in common. Wood is increasingly popular in bathroom designs. 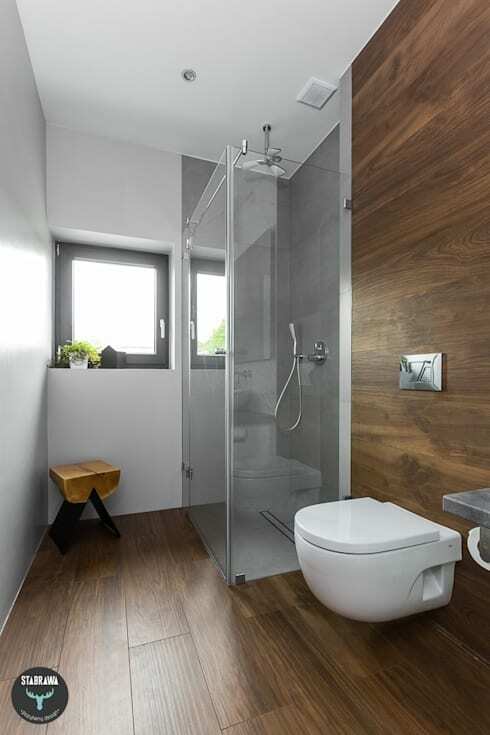 Here the wooden floors and walls are dominant and really define the look and feel of this bathroom. This has been done by installing minimalist bathroom fixtures. The shower stall is designed as a shower room with a transparent glass shower wall. The toilet has also been mounted on the wall. 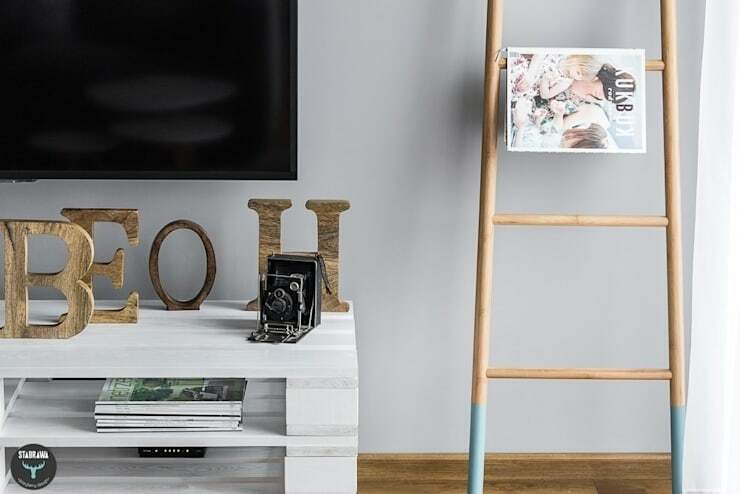 Both of these elements barely take up any visual space so the wood remains the focus. Finally, note the chunky wooden stool made from a hunk of log. It adds that earthy charm so often seen in this type of home. For more home design inspiration, have a look at 9 small apartments with a unique feature. 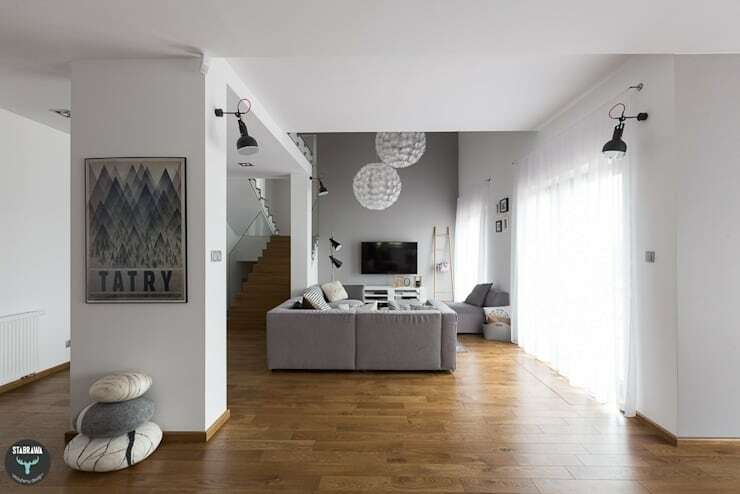 What do you think of the restricted colour palette in this home?